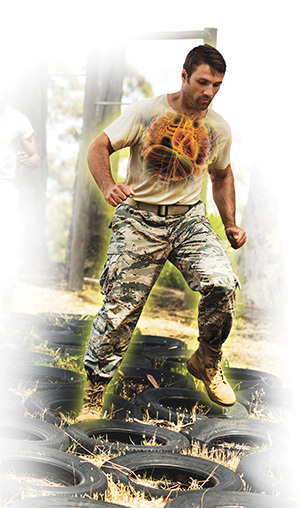 Cutting-edge nutrition science keeps the U.S. military at peak fitness and prepared to serve. And the discoveries Tufts researchers are making in the lab and in the field could help weekend warriors, too. The quest to keep troops well fed has led to all sorts of innovations. We have military scientists to thank for the enzymes that keep supermarket bread from going stale, the energy bars that stay soft for months, and even TV dinners, which started as in-flight meals for World War II bombers. But in more recent years, the U.S. military has moved away from simply feeding its troops to nourishing them for peak performance—and it has turned to Tufts for expertise. Researchers at the Friedman School and the Jean Mayer USDA Human Nutrition Research Center on Aging (HNRCA) at Tufts have a particularly long relationship with the Military Nutrition Division of the U.S. Army Research Institute of Environmental Medicine (USARIEM) in Natick, Mass. Since the 1990s, Tufts scientists have collaborated with the Natick team on dozens of nutrition studies—in areas such as maintaining strength, preventing injury and improving endurance—that influence policy in all branches of the military. Often, the answers benefit the broader public. Research on fluid requirements, for example, has produced widely used hydration guidelines, and extensive studies on the safety of caffeine—a staple of late-night guard (or desk) duty—have informed coffee drinkers everywhere. Here are some of the nutrition research projects that are helping the nation’s warfighters—and how they could help civilians and athletes on the home front. Service people face many threats when they are deployed overseas and one of the most common is an enemy from within: traveler’s diarrhea. Joke all you like about Montezuma’s Revenge, but about one in three personnel deployed to less-developed countries will have it in a given month. And getting it once makes you five times more likely to develop a chronic gastrointestinal disorder. USARIEM researcher J. Philip Karl, NG14, is investigating prebiotics, including special dietary fibers, consumed by beneficial gut bacteria—perhaps a system full of good microbes will make it harder for invading pathogens to stake a claim. He is also experimenting with polyphenols, plant chemicals consumed by microbes that, in turn, create possibly beneficial byproducts. “We’re interested in looking at combinations of different polyphenols with different prebiotics to see if they could have potentially synergistic effects,” Karl said. This research might one day change the makeup of Meals-Ready-to-Eat (MREs). 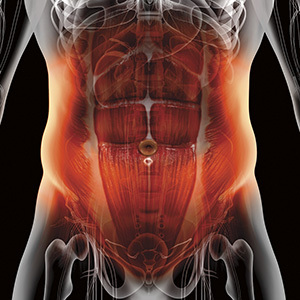 On The Home Front Gastrointestinal distress is common in people taking up endurance sports, such as marathons, and this work could help athletes with nutrition-based strategies for avoiding the upset. Karl hopes the research will also contribute to our understanding of how the microbiome interacts with nutrients to improve long-term health. 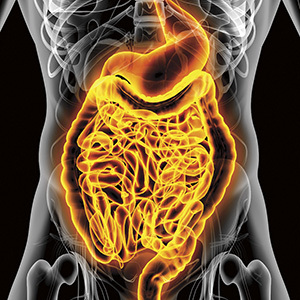 Engineering professor Sameer Sonkusale and HNRCA scientist Jimmy Crott, an associate professor, are working to unravel the connection between our gut bacteria and our psychological health. They are collaborating with the Department of Defense’s Office of Naval Research to develop an ingestible “lab on a pill” to study the microbiome. It could lead to nutritional interventions that help service members weather stress and sleep deprivation. On the Home Front Research into the microbiome, sometimes called the body’s second brain, benefits G.I. Joes and Average Joes alike. “For people to fight, they need energy,” said Oliver Chen, interim director of the HNRCA’s Antioxidants Research Lab. Digestion of simple carbs like white bread can happen too quickly, leading to blood sugar crashes. Although eating fiber can slow the process down, it has its own problems: It’s bulky to carry, and high-fiber foods might make soldiers feel full and stop eating before they take in all the energy and nutrients they need. On the Home Front A food product that offers a source of sustained energy would benefit endurance athletes. Chen said it could also be the ideal snack food for children at sports practice, who need energy but not a sugar rush, and for diabetics in need of a steady source of glucose. A service member can burn as many as 7,000 calories a day, said Andrew Young, a research physiologist and former chief of military nutrition research at USARIEM. “When on a mission in the real world, they simply can’t carry enough food to sustain themselves in energy balance.” And when they burn more calories than they take in, they start losing weight—about 50 percent of it from muscles, which leads to declining physical performance and increased risk of injury. One solution may start with protein. Tufts nutrition researchers working with the SARIEM helped demonstrate that when calories are insufficient, consuming more protein—more than the recommendation daily allowance—helps preserve muscle. That insight led to changes in the Military Dietary Reference Intakes, which dictate the nutrition requirements in rations. On the Home Front This research could help determine how much and what kind of protein is best for dieters, who don’t want to lose muscle. The consensus, Karl said, is that the average dieter should consume 50- to 100-percent more protein than the recommended daily allowance when physically active. The work could also deepen our understanding of sarcopenia: Starting as young as age 30, the average person starts to drop muscle at the rate of about 1 percent per year, adding up to a loss of one-third of the body’s muscle mass by age 70. Helping troops safely lose weight is an ongoing challenge. Col. Gaston Bathalon, N90, NG98, who established the Military Weight Management Program while at USARIEM, found that more than 71 percent of troops referred for weight loss at one Army medical center reported skipping meals and 31 percent reported fasting. Weight control is also a problem for military families. Professor Susan Roberts, director of the HNRCA’s Energy Metabolism Lab, and scientist Sai Das, NG02, are in the midst of a five-year Healthy Families, Healthy Forces study with USARIEM to test different approaches to weight control. The study is introducing adult dependents of military personnel to two programs: one that includes standard dietary advice, and one created at Tufts that focuses particularly on hunger management. The Tufts program, known as the Healthy Weight for Living plan, also provides strategies for eating in times of stress. They will report on which diet is more effective. “An eventual outcome of that is it would reduce military health-care burden as well as cost,” Das said. On the Home Front According to the 2015 Youth Risk Behavior Surveillance System, nearly 30 percent of high school students are overweight or obese, and the New England Journal of Medicine recently reported that new cases of Type 2 diabetes in people under age 20 increased nearly 5 percent per year from 2002 to 2012. Knowing that even service members are at risk of diabetes could serve as a wake-up call to teenagers who don’t want to give up their chips and soda. The USARIEM facilities have specialized laboratories for testing the extreme conditions that soldiers face: heat of the desert, the cold of the tundra and the altitude of high mountain regions. One insight they’ve made is that people suddenly exposed to high altitudes tend to eat far less. “It’s very common that over the first several days or weeks, people stop eating without thinking,” Karl said. Nausea from Acute Mountain Sickness probably contributes to the problem, but changes in brain chemistry and hormones also seem to temporarily suppress appetite. Meanwhile, the stress of the low-oxygen atmosphere can create a sort of insulin resistance, making it harder for cells to take in energy. Last year, Karl and his colleagues went to Pike’s Peak in Colorado to study nutrition needs at 14,115 feet. They fed volunteers diets with different amounts of protein to see how well they maintained muscle while losing weight, and whether the protein helped or hurt appetite. They also fed volunteers a multicarbohydrate blended drink to see how efficiently they burned carbs during exercise. While the results are still being compiled, they suggested that the body handles carbohydrates very differently at high altitudes, an effect that can influence appetite for at least three weeks. For new recruits, repetitive, jarring activities, such as marching with body armor, can put strain on bones, leading to tiny cracks. During basic combat training, up to 20 percent of women and 5 percent of men develop stress fractures, and up to 60 percent of those have to drop out of service. Not only do they lose out on a military career, said USARIEM scientist James McClung, but “they may now be a part of the military health-care system for the rest of their lives”— at significant taxpayer expense. Part of the problem, McClung found, is that recruits often arrive with poor levels of vitamin D. That led to the development of a before-bed snack bar, pumped with calcium, vitamin D and protein. 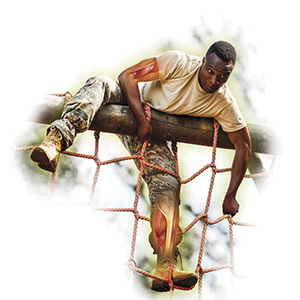 In several tests, recruits who ate the bars showed increased bone density, which reduces the risk of injury. The Performance Readiness Bar will be available to recruits at all four U.S. Army basic-training locations in 2018. On the Home Front Although there aren’t yet plans to make the Performance Readiness Bar available to the general public, this research may help marathoners and other athletes at risk of stress fractures. It also adds to the research on bone health, which is especially important as we age. 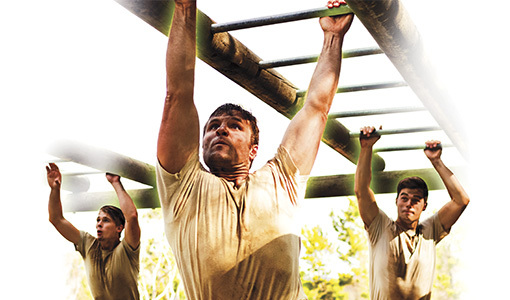 Basic training is legendary for the strain it puts on the muscles and the psyche. But all those push-ups and full-gear sprints also kick the immune system into high gear, sending out cellular emergency signals that can cause damage. “There is an inflammatory response to exercise, particularly unaccustomed activities,” McClung said. That inflammation, it turns out, can interfere with the body’s ability to absorb certain nutrients. In a series of experiments, McClung and his colleagues, including J. Philip Karl, discovered that women in basic training often deplete their iron stores. 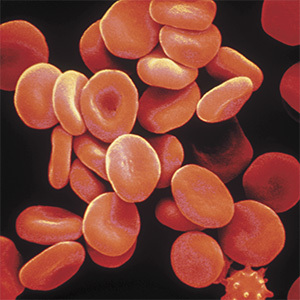 The inflammation appears to degrade a particular protein that helps transport iron into the body for incorporation into red blood cells. Without enough iron, fatigue may set in. As a result of the work, in 2015 the army began offering its female recruits multivitamins with extra iron—along with a bit of nutrition education—during their basic training and are monitoring the results. On the Home Front “We get a lot of queries from the athletic community regarding this research and options for female athletes,” McClung said. He emphasizes the importance of an iron-rich diet, and, if necessary, consulting a health-care provider to determine the right supplement. A new entrepreneurship program will give students the skills they'll need. With a little help from Tufts, an immigrant farmer sustains her family, her culture and a diverse community. These emergency meals are new, improved and engineered to save lives. What’s a Dietitian to Do? Challenges lead to hope in Malawi’s first R.D. training program. Unearthing ideas to fix the bad stuff, Food Tank starts with the good. Why complex carbs are the clear choice for preserving vision. Unpacking the science related to diet and breast cancer.